To mark the publication of the Representative Church Body Library‘s latest volume in its Texts and Calendars series: Episcopal visitations of the diocese of Meath 1622-1799 (taking place tomorrow, Thursday, 6 July at St Patrick’s Cathedral, Trim) we offer a brief insight into this important study. Edited by Dr Michael O’Neill and published by the Four Courts Press (www.fourcourtspress.ie), in association with the RCB Library, this book will make a significant contribution to our knowledge of the diocese of Meath in the early modern period. Episcopal visitations are formal/structured accounts – parish by parish – which build up to give an in-depth state of a diocese at a given time. Specific questions were asked and the answers – and indeed non-answers or evasions – helped the bishop to build up a picture of the diocese, and the strengths and weaknesses of individual parishes and clergy. The early visitation records of the Church of Ireland were largely destroyed in the fire at the Public Record Office of Ireland in 1922, which greatly enhances the significance of those that have survived in copy form. 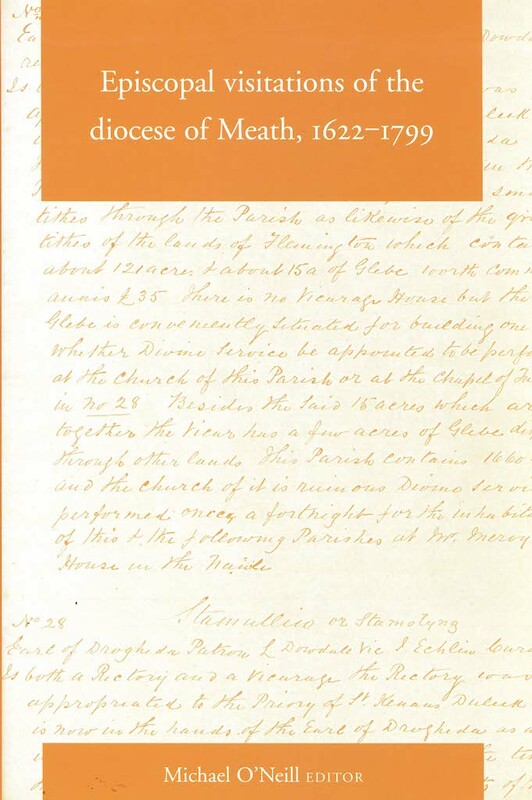 The current volume provides editions of the visitations of the diocese of Meath for the years 1622, 1693, 1733 and 1799, covering the episcopates of James Ussher (Bishop of Meath from 1621 to 1625), Anthony Dopping (bishop from 1682-97), Welbore Ellis (1732-34), and finally Thomas Lewis O’Beirne (1798-1823). Two of these sources are located in Marsh’s Library, Dublin, the third in the RCB Library, and the fourth in the Library of Trinity College Dublin. This is the eighth volume in the RCB Library’s Texts and Calendars series, and the first to focus on sources outside Dublin. It brings all four diocesan visitations together as a single edition, offering unique insights into the life of the Church of Ireland and its interaction with the wider community, from the post-Reformation period to the eve of the Act of Union. As the enlightening introduction reveals, there is much in the content of these records about the spiritual and temporal life of the Church in a large Irish diocese during the 17th and 18th centuries, providing a framework for more detailed studies of localities, based on the records of individual parishes.